Terminal Lance, an edgy comic lampooning enlisted life in the Corps, will now grace the pages of Marine Corps Times on a weekly basis. Look for it in our Opening Shots section starting Monday. If you are one of the tens of thousands of people already familiar with the work of former Lance Cpl. Maximilian Uriarte, you’re probably excited by the news. 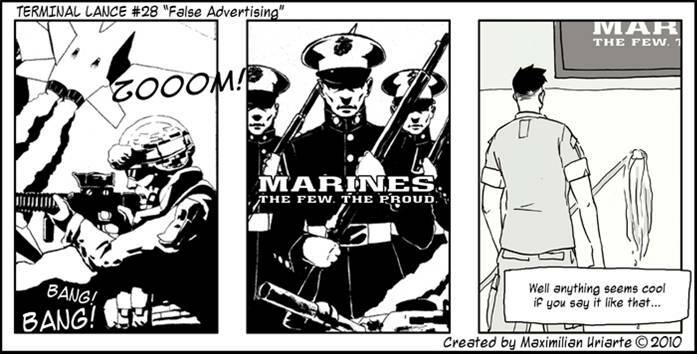 He began posting the comic strip on the website Terminallance.com last January, and it gained an immediate cult following. Here is a sampling of some of his past work. Because the strip is known for salty language and risque themes, we had to choose one of his family-friendly strips to show here. Editions running in our paper will also be PG — well maybe PG-13 — but Uriarte says he won’t shy away from important topics. He will just use a little more finesse to deliver his punchlines. If you want to catch up on some classic Terminal Lance, check out his website, but be warned: It’s not for the easily offended. 1st?? Thats awesome, love the strip! Awesome news! Good for Max! Good job max the corps won’t know what hit em!!! I have been reading his strips for a while, he is the best!